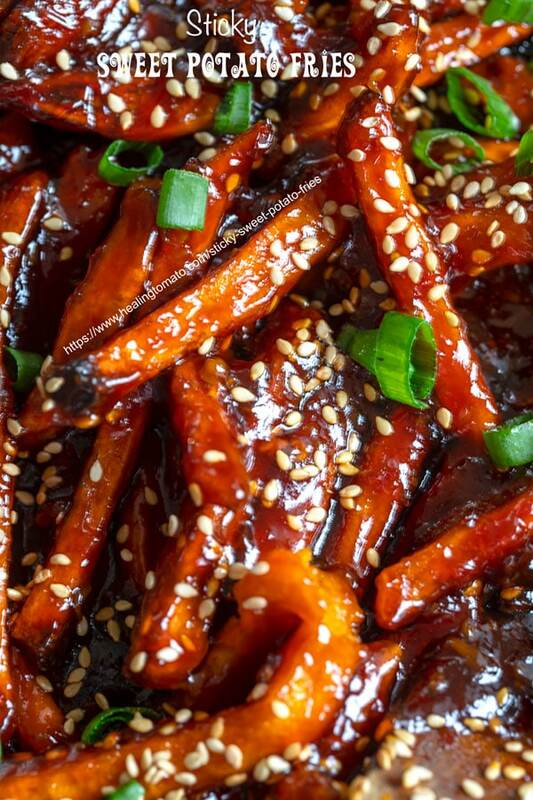 Oven Roasted Sweet Potato Fries mixed with sweet, spicy and sticky sauce. 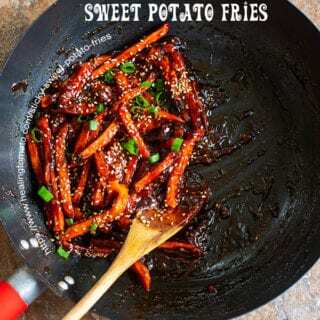 These sticky sweet potato fries are definitely delicious and completely worth all the sticky mess! 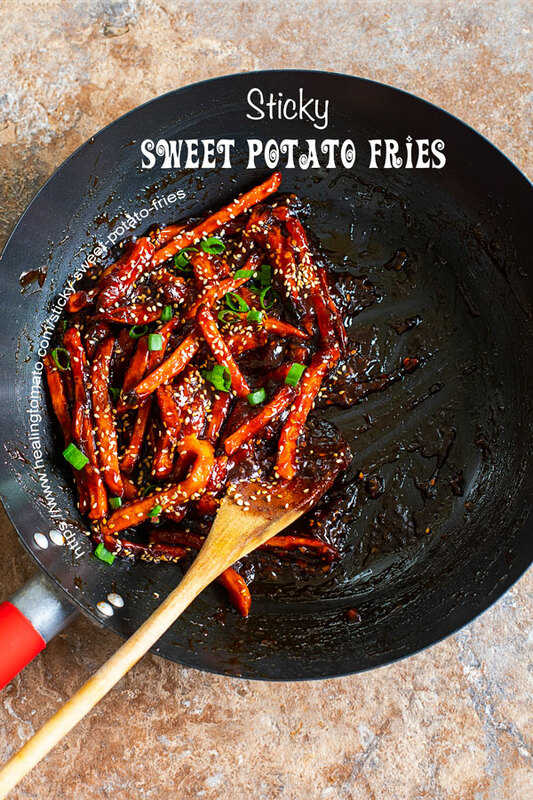 Do you love sweet potato fries? Of course you do! Who doesn’t love them! Potato fries of any kind are a huge attraction and practically irresistible! I have never been able to resist a French fry, if its put in front of me. Once in a while, I like to change up my French fries. Remember my sweet potato wedges or butternut squash french fries. How These Sticky Fries Came To Be! The other day, I ordered the Chinese broccoli and I had some of that sticky sauce left over on my plate. On the other side of the table, I had a friend who ordered French fries and let me taste one them. There was no ketchup left and I was too lazy to get up for ketchup packets! So, I dipped them into the sauce left over from my broccoli sauce. 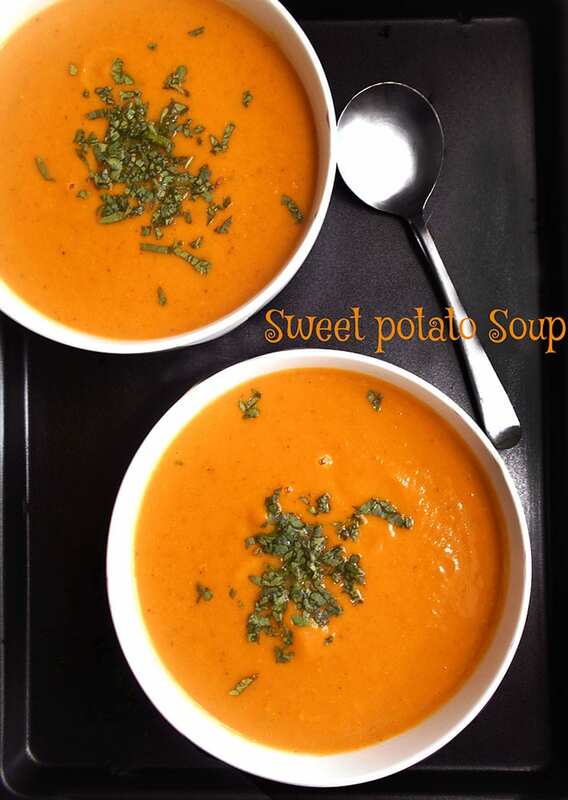 The rest is sweet potato history! Sometimes, laziness does pay off in a big way! Since I was short on time, I thought it would be faster to use frozen sweet potato fries. But, you can make your own sweet potato fries from fresh sweet potatoes. 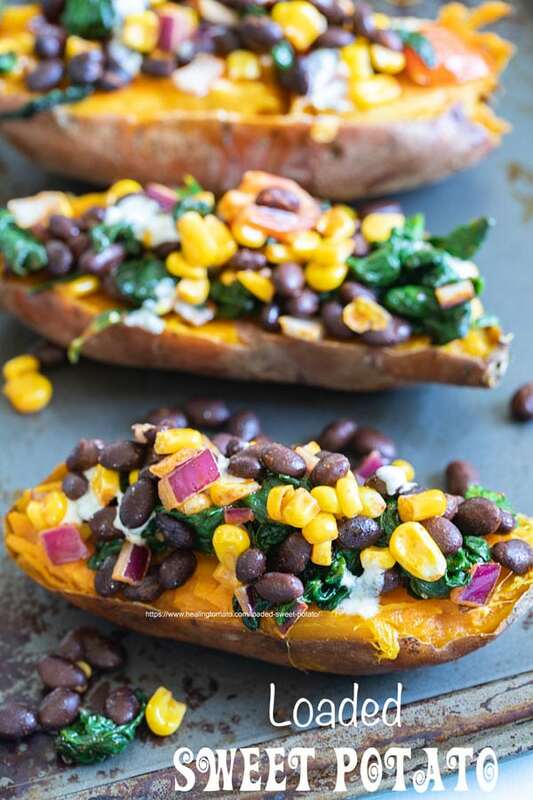 If you have time, I think fresh sweet potatoes would be even better. I also wanted to add more ingredients in these sticky sweet sauce. What do you think of having these ingredients? – Red onion (julienned and added as garnish)? – Mushrooms (very thinly sliced)? – Bell Peppers (Red or Green, julienned)? – Bean sprouts (as garnish)? – Broccolini Rabe (Instead of the sweet potatoes)? 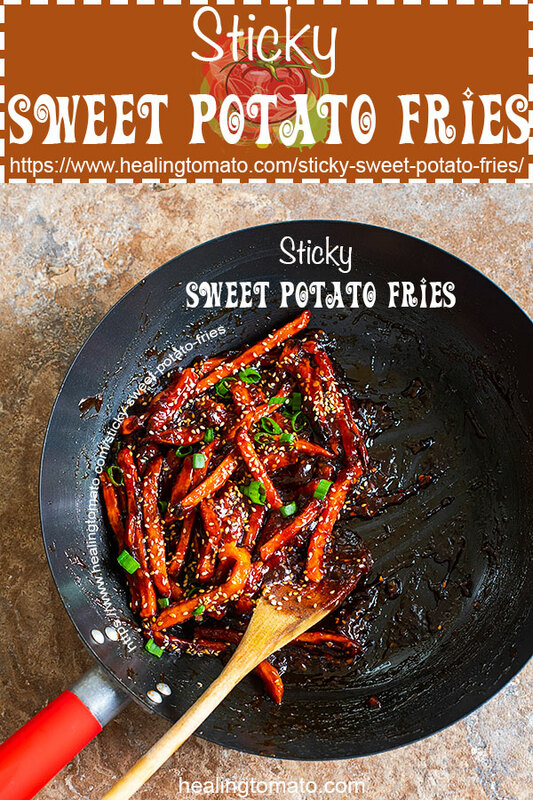 If you are not sold on using sweet potato fries with this sauce, you can still use the sauce as a base to add other ingredients. 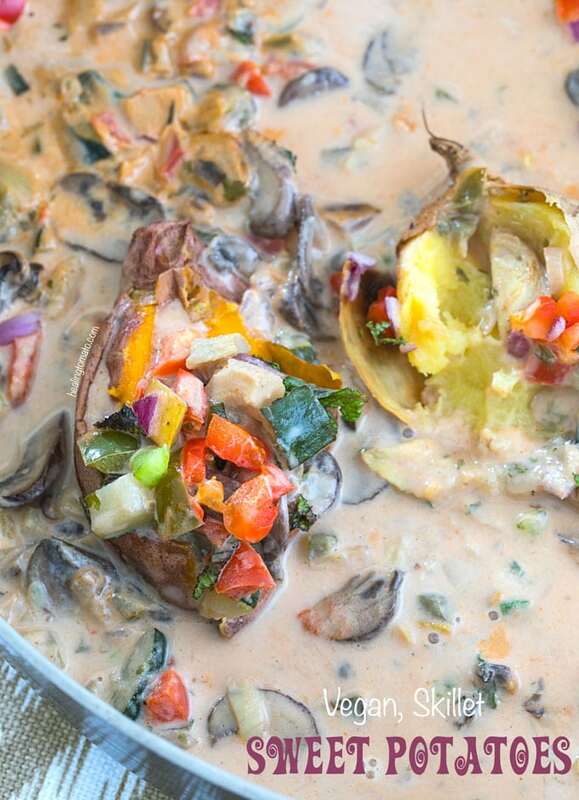 This sauce is so versatile that it will go with almost any ingredient. My favorite has always been with steamed broccoli, but, I think tofu, noodles and maybe even pasta will work with the sticky sauce? This recipe was also a chance for me to use my wok again. 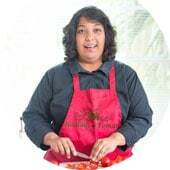 I used it to make my kadai paneer and it has been my most used kitchen pan since then. 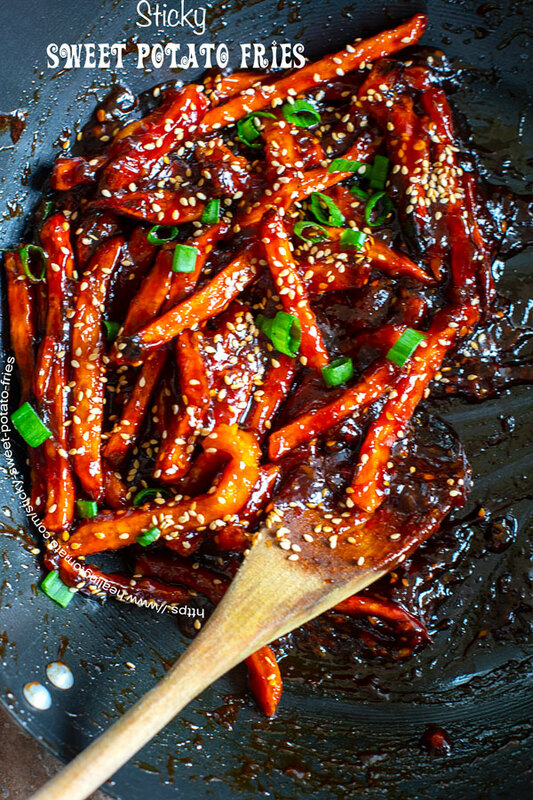 This recipe works very well if you use a wok. Here is one I recommend from Amazon (affiliate link) PFOA-Free Jumbo Wok. 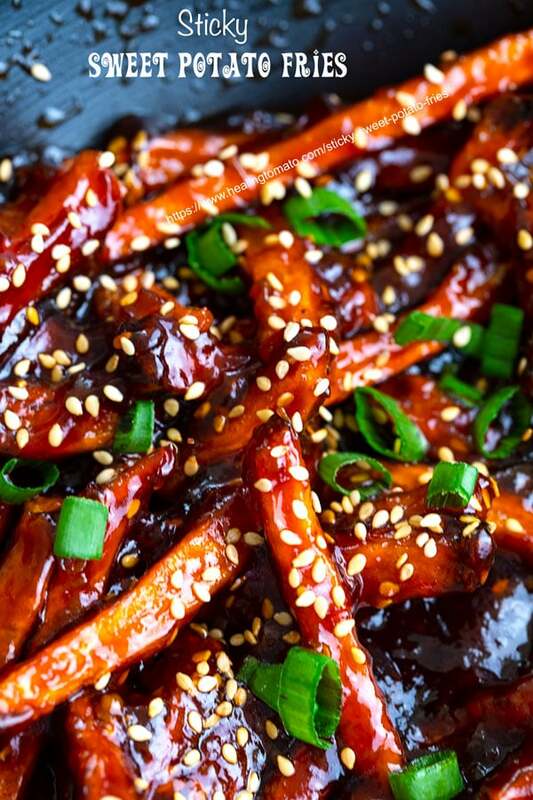 So, did you try these sticky sweet potato fries? Be sure to rate this recipe in the comments section below. I am always eager to hear from all of you. If you are looking for a few more vegan French fries recipes, check out these sweet potato poutine by Take Two Tapas. She uses marshmallow fluff that you can easily make at home using aquafaba, (affiliate link) cream of tartar and vegan white sugar. Whip up the ingredients until its nice and fluffy. Check out my useful guide on what vegans don’t eat and some helpful alternates to your favorite non-vegan ingredients. 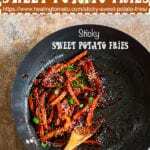 Quick, easy sweet potato fries. 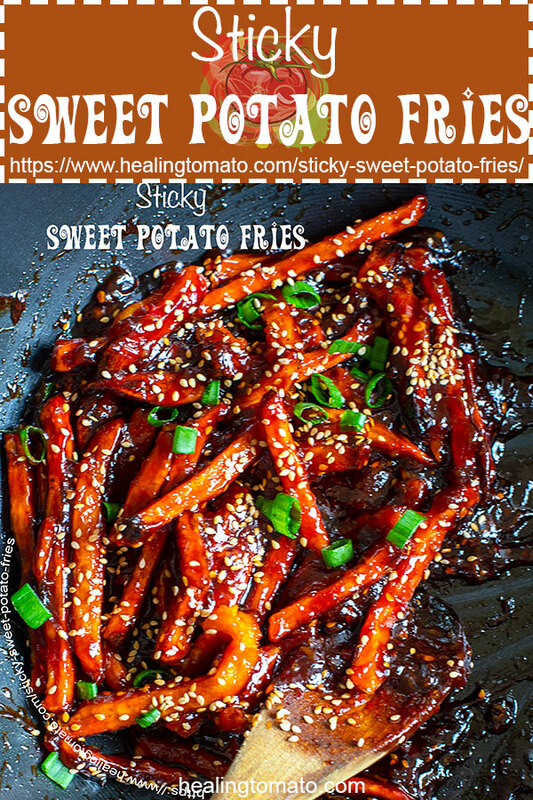 I absolutely love sweet potatoes and these saucy fries sound amazing! These look incredible and had my mouth watering! I can’t wait to make these for my family.